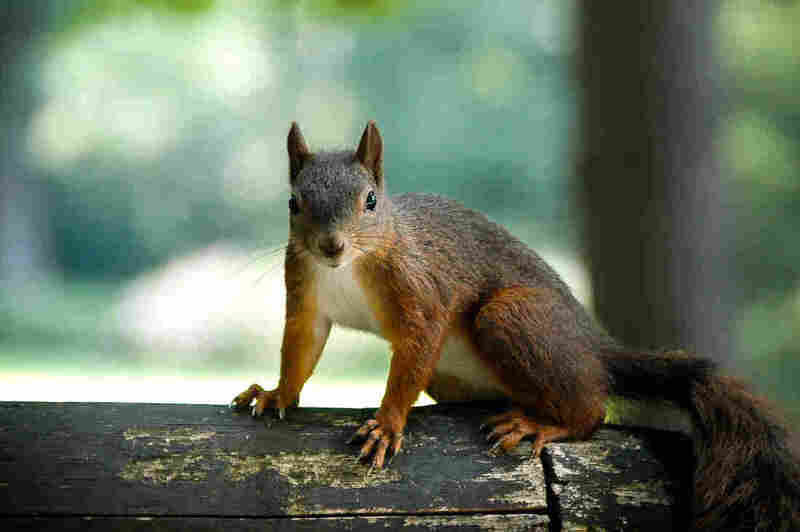 Squirrels Mimic Bird Alarms To Foil The Enemy It can take more than just a keen ear to figure out what animals are saying. Sometimes, scientists are learning, you have to talk back to map the rich networks of conversation in a forest. Squirrels closely mimic bird warning calls and help spread the alarm through the forest that hawks, owls or other predators are nearby. Ornithologist Arthur Allen of the Cornell Lab of Ornithology was a pioneer, hauling bulky recording gear into the wilderness in the 1940s and actually cutting acetate records of bird song on-site. Let's fast forward 45 years and talk to Ted Parker, who inherited Allen's gift for recording birds, but added a twist. "Up here in the canopy, these are the hardest birds to detect," he told an NPR Radio Expeditions team in 1991 in the Bolivian rain forest. Parker was an ornithologist with Conservation International who spent months at a time in the tropics, lugging around a portable tape recorder. His skill in using his ears to investigate the world was legendary. "My parents bought me records of bird recordings that were made by people at Cornell," Parker told the NPR team in 1991. "I spent hours moving the needle back and forth, and back and forth, and my mother would say, 'You are going to destroy the record player.' "
Some called Parker the Mozart of ornithology. He'd memorized the sounds of more than 4,000 bird species. He used this knowledge and his tape recorder to quickly take an extensive and detailed census of birds in the tropics. "These birds spend all their time in that foliage that's 130 to 140 feet above the ground," Parker explains on the tape. "And if you don't know their voices, there's no way you could come to a place like this and come up with a good list of canopy species." Parker wanted more than lists, though. He wanted to know how birds divide up their territory. Who lived in which part of the canopy? And how do you find that out, if you can't see them? Here's how: Parker realized that each mating pair of birds has its own territory. If he could provoke the pairs — challenge the birds somehow to defend their little patch of forest — they would reveal their location and the extent of their territory. Ted Parker, a pioneering ornithologist who died in 1993, has been called the "Mozart of ornithology." 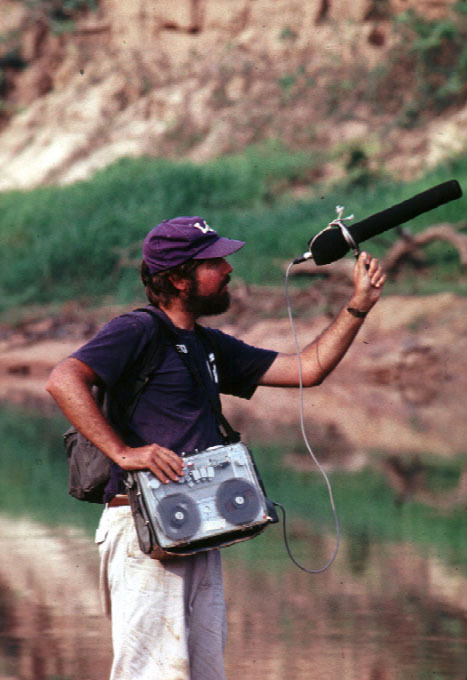 He memorized the sounds of more than 4,000 species, and used recordings of calls to get birds to reveal their territories. So, how did he provoke them? Parker recorded the calls of a mating pair, then played their own song back to them. That confused the pair — they seemed to think that outsiders were threatening to invade. "If you are outside their territory and you play back a song," Parker said in 1991, "the birds will come up only to the edge of their territory." Perched on the boundary, he noticed, the pair would start to vocalize — in essence, shouting, "Hey, get out of here!" "What I try to do is arouse them all," he said. "I get a pair here, a pair there — a pair behind me there. I can quickly draw those territories on a map. Then I move farther on until I get the next pair. You can map all the territories in a forest eventually. The only good census that's been done in a rain forest was done that way — by mapping counter-singing pairs." Parker was doing just such a bird census in Ecuador when he died in a plane crash in 1993. He was just 40 years old. Even after Parker's death, his technique of provoking birds to reveal their behavior stuck with other scientists. Recently, a biologist using a similar technique discovered something no one had imagined — that these bird warnings are adopted, and passed along, by completely different types of animals. At his lab at the University of Montana, biologist Erick Greene explains how this works. 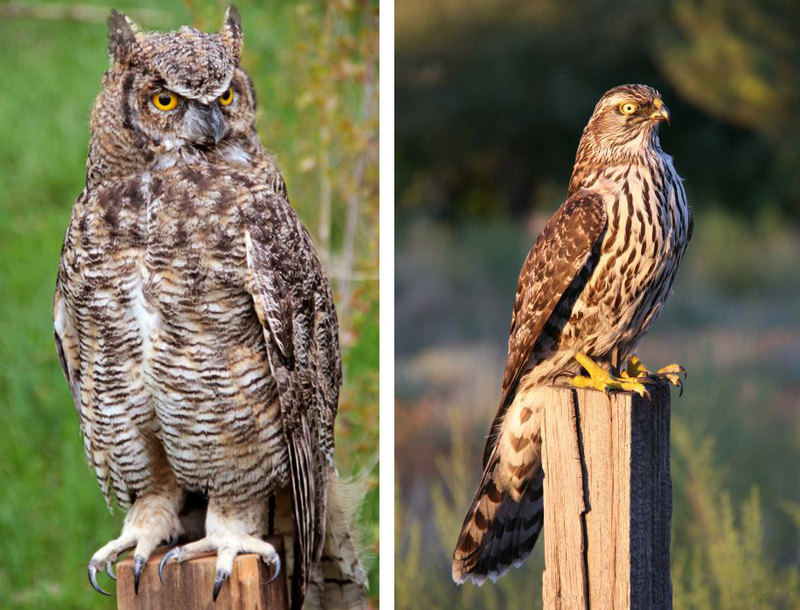 A small bird spots a dangerous predator — let's say a hawk or owl — flying around. It warns other birds by making a soft, high-pitched seet call. Like any self-respecting birder, Greene can imitate this alarm call exactly. "It's very high frequency," he explains, "and it's hard to locate." Then there's also a mobbing call. Greene demonstrates by pressing his lips to the back of his hand and making an irritating sound like screeching tires. Birds make that call when they see a perched predator. It brings other birds out of the trees to "mob" the predator and chase it away. Now, Greene had watched birds do this for years when he noticed something, well, squirrelly. Squirrels seemed to be mimicking these warning calls from birds, too — taking up the alarm as soon as they heard it, Greene realized. What's more, the squirrel's mimicry is nearly perfect, though the furry animals have a very different vocal apparatus from the one birds use. Chipmunks make these calls, too, Greene noticed. He was astonished that mammals and birds — biological families as different as mice and magpies — would share this early warning system. "We've got these complex communication networks," Greene explains, "and it's not just one species yakking to members of its own kind. It's all these different species — and not just birds, but mammals as well. And they're all sharing information." As a scientist, Greene knew he needed to observe this behavior consistently, many, many times, before he could be sure he was interpreting it correctly. To help him provoke the birds and squirrels in a consistent way, he turned to "robo-raptors" — mechanical birds of prey. In his lab at the university, Greene holds a dead owl. "This is going to be a robo-pygmy owl," he explains. It's stuffed with small motors and a computer board that allow it to move. The head swivels in a very creepy way. These mechanized birds are Greene's villains. He takes them into the forest to set off this alarm system. One of us — Bill McQuay — heads to the woods near Ithaca, N.Y., with Greene's team, to see the robo-raptors in action. Initially, Greene hides these mechanized predators inside a fake tree trunk 2 feet high, then walks away. He can raise and lower the top of the trunk with a remote control. After a little time has gone by, and all is quiet near the fake stump, the research team activates the remote. The trunk slowly slides down to expose the robo-raptor. Biologist Erick Greene's team used a robotic horned owl (left) and a robotic hawk to provoke other birds into making various alarm calls he could record and study. It doesn't take long before a tufted titmouse spots the "predator" and starts its mobbing call. Then a white-breasted nuthatch joins in. Then house sparrows. And if that's not enough, the jays and cardinals chime in. And — just as Greene has now observed numerous times — the squirrels get into the act too. It's a madhouse. Working together, the birds, squirrels and chipmunks propel these warning signals through the forest at 100 mph. "It's almost as if you've got a bow wave preceding the raptor," Greene says — a wave of sound that moves like water pushed ahead of a ship slicing the sea. Greene sympathizes with the raptor. "In many ways, I've come to appreciate that it's hard to be a hawk," he says. "As soon as it's spotted, the alarm flies far faster through the woods than the hawk can." Greene and Parker are typical of many close listeners; they studied nature, and learned to hear the world as other animals do. The world they discovered is in a constant state of negotiation — across species, through the ocean and the forests — everywhere there's life. This story is part of Morning Edition's weekly series Close Listening: Decoding Nature Through Sound. The summer series is exploring the culture of listening that's developed among scientists seeking to understand how animals communicate. Bill McQuay is an audio producer at the Cornell Lab of Ornithology. Alison Richards, NPR's senior editor for science, is the series' editor.